Best known for his still-lifes, Wayne Thiebaud's Sugar, Salt and Pepper is a powerful example of the artist's ability to transform simple objects into works that are oddly moving and have a subtle humor that is uniquely his own. The deadpan quality of Thiebaud's work belies an artist passionate about the possibility of paint--"People say painting's dead. Fine. It's dead for you. I don't care. Painting is alive for me. Painting is life for me" (as quoted in Wayne Thiebaud: A Paintings Retrospective, New York, p. 41). For over 40 years, Thiebaud has been involved with a painterly investigation of American life through its objects, people, streets and landscapes, always realized in a deliciously painted but highly controlled manner. Like Morandi, Thiebaud is looking for larger truths in small gestures. Morandi's spartan compositions of a few objects, arranged on a tabletop with the background subdivided into horizontal planes of monochromatic color were of enormous influence to Thiebaud. Thiebaud has spent most of his life in California and his work is in many ways related to the group of influential artists from Northern California, known as the Bay Area Figurative painters. Marked by a gutsy painterly style, the defining moment of that group came in 1957 when artists such as Elmer Bischoff, David Park and Richard Diebenkorn were included in the eponymously titled exhibition in 1957. In the late 1950s, Thiebaud worked in a similar manner, creating gestural, representational works that were indebted to his hometown peers, as well as to the East Coast Abstract Expressionists. In the early 1960s, however, Thiebaud rebelled against the angst-ridden brushstrokes of his peers, creating his own brand of painterliness, one in which his surfaces are deliberately and masterfully controlled. He also began to draw on his past experience as a commercial artist, creating eye-catching works with a directness and economy of means that are indebted to his advertising work. Thiebaud's mature work coincided with the explosion of interest in Pop Art in the early 1960s art scene, which has caused Thiebaud to be linked, albeit uneasily with that movement. 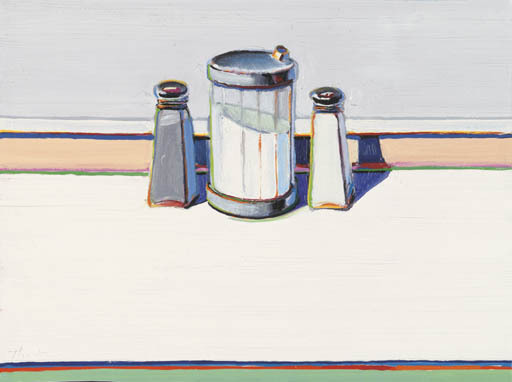 Sugar, Salt and Pepper depicts the ubiquitous condiments that populate every American diner and coffee shop. Unlike Pop Artists who use cultural signifiers to ironically comment on culture, both high and low, Thiebaud's work is more concerned with the formal issues of paint. Sugar, Salt and Pepper has a strong architectonic composition, rigidly anchored in place with a symmetrical alignment and severe horizontal bands of color. The paint is languidly brushed in horizontal strokes across the canvas in his trademark cake-frosting tones of white, while the racing-stripe colors along the bottom and the crisp high key color highlights bring the entire surface to life. "Thiebaud is an artist of charm, comedy, precise observation, and a pensive sense of longing. He is as major as those things are. He takes as his subject, and expresses as his preoccupations, light, longing, dessert, our strange cities, the California landscape, the nature of American manufacture and the manufacture of American nature, abundance and exclusion and the pleasures and risks of window shopping, and his art is exactly as large or small as those things seem to you" (Ibid, p.66).